The first picture is our youngest girl Molly. 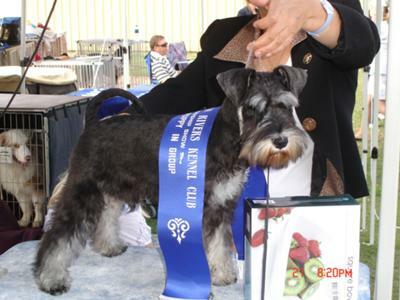 she is bred to show and her first show was evident. she did very well in her first show. The second pic is of both our little girls. Elke is too small for the ring but boy she is so precious. she is small for a mini but her personality makes up for her petite size. 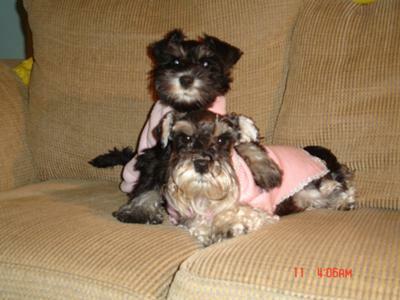 Elke was our first mini schnauzer and she will always be the best dog we have owned. The picture of the two of them is of them watching the friday night footy. Molly is beautiful! Elke is a beauty also! You should be proud of both . . . which I'm sure you are. Double the joy!! Molly is sooooooooooo beautiful. I just love her face. Elke looks like she may be following in Molly's foot prints.